Montgomery Ballet is proud to announce its 43nd annual performance of Tchaikovskys The Nutcracker December 6-9, 2018 at Troy University’s Davis Theatre in Downtown Montgomery, Alabama. Founded in 1958, Montgomery Ballet is the only professional dance company in the city of Montgomery and is one of two in the state of Alabama. Montgomery Ballet will be hosting their annual summer intensive. All applicants must audition. Audition can be done via class, video or a schedule audition date. The auditions dates are March 25 and April 22. Open to anyone interested in coming with pointe experience. Open House Saturday August 19, 2017! The Montgomery Ballet School invites you to attend our Open House event on Saturday August 19! From 9 am-12 pm, you can tour our facilities, meet our School Director and instructors, and check out the full array of classes we have to offer for Dancers ages 2 through Adult! We have some special surprise guests, as well as treats generously provided by Panera 1615 on Carter Hill Road. Come out and see what we have to offer! Classes start August 14th! Enroll now! Montgomery Ballet is currently accepting auditions for company, apprentice, and trainee positions. Salary is commensurate with experience and employment can also be provided through teaching in the Montgomery Ballet school. Interested parties may send resume/CV and video links to info@montgomeryballet.org. Videos must include short barre work, turns en dehor and en dedans (on pointe for ladies), petit allegro, grand allegro, and coda work (tours for men). Your video may also include classical and contemporary work, and performance excerpts. Montgomery Ballet’s Summer Intensive Program focuses on ballet, and also offers a wide variety of classes in other dance forms including Jazz, Modern, Variations and Partnering. Our 2017 Summer Intensive program dates are July 10-August 4, 2017. The program is designed for those who desire the best training available and to offer serious dancers insight into life as a professional dancer. All dancers accepted to our 2017 Summer Intensive Program will be notified via email. Our registration deadline is June 15, 2017 and requires a 30% non-refundable deposit to secure your spot. In order to participate in our Performance on the Green at Alabama Shakespeare Festival you must attend the last three weeks of the program. If you have any questions, please contact us 334-409-0522 or info@montgomeryballet.org. 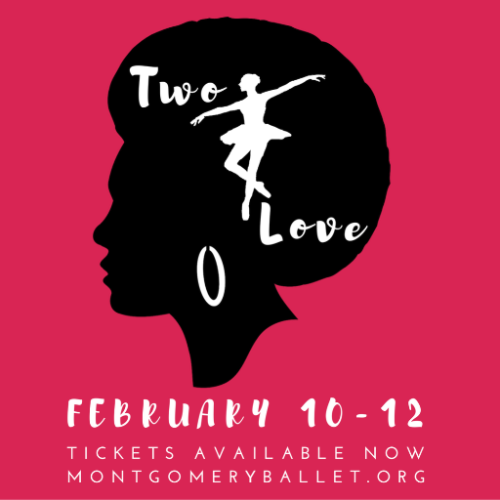 Montgomery Ballet is pleased to announce its premiere presentation of Two for Love, a two act production, just in time for Valentine’s Day. The professional and civic companies will be featured in a classical adaptation of the third act of Sleeping Beauty, a gem of a ballet that is an important part of a ballet company’s repertoire. We will also premiere Silly Love Songs, a contemporary ballet set to popular love songs from the 70s. This new work is choreographed by Co-Artistic Director Joseph Villalobos. Held at The Sanctuary, the music and dancers in an intimate setting are a perfect way to get your Valentine’s Day weekend started! Literature, United States History, and dance intersect when Montgomery Ballet takes on Washington Irving’s fall classic, Sleepy Hollow! Schools, homeschool groups, and youth groups are invited to take advantage of discounted performances through Montgomery Ballet’s Linking Education with the Arts Program (LEAP). Call us at 334-409-0522 or email us at info@montgomeryballet.org to reserve tickets for your school or group! You may also complete our LEAP Ticket Order Form by clicking here. It’s not too early to reserve seats for our LEAP performances for the 41st Annual performance of The Nutcracker! Join us for Montgomery Ballet’s spin on Washington Irving’s classic American fall tale, Sleepy Hollow! We are happy to offer free admission for Military Service Members and First Responders with ID. Free admission applies to currently serving or retired service members and first responders. Family members are not eligible for this promotion. General admission is $15 for adults and $12 for children. Seats are on a first come, first served basis with the exception of reserved seating for our season pass holders. Add to the fun! Get in the festive spirit with us by wearing your family-friendly Halloween costume to the performance!